Moral sentimentalism rules the ethical landscape. For radical change, the Left should take morality back. At the end of the go-go nineties, in the same year that Glass-Steagall was rescinded, the New York Times Magazine invited former Letterman comedy writer Randy Cohen to pen a column called “The Ethicist.” The feature’s success revealed the spirit of the era. On the one hand, there was our general anxiety that the prosperity of the time was vacuous and undeserved. On the other hand, a serious column on ethics would have missed the mark. Cohen’s comedic touch and the irony of doing a “Miss Manners” column on the weighty topic of ethical conundrums struck just the right balance. If you were one of the fortunate getting rich e-trading or taking your start-up public, the least you could do is tip waiters with the utmost probity. But as the scandals of the aughts piled on top of each other — Enron, WorldCom, the Iraq War, Halliburton, torture, Gitmo, liar’s loans, Madoff, financial piracy, drone assassinations, gross inequality, precarity, and the threat of environmental apocalypse — “The Ethicist” became absurdly out of step. Sure, Cohen occasionally devoted inches to the weightier problems of the day, but for the most part he stuck to his bread-and-butter topics: the rules of condominium parking, how far to push your child in the private-school meritocracy, and the requirements of being an upstanding co-op member. In 2011, the redesigned magazine, under new leadership, mercifully put Cohen to pasture. Yet “The Ethicist” continues to this day, with less humor and more earnestness, under pop-culture journalist Chuck Klosterman. “The Ethicist” has become transfigured into a brand, floating free from the flesh-and-blood Cohen. It’s something Times editors think their readers expect every Sunday morning along with their brunch fare. The evils of the news section may be beyond our control, but at least we can be ethical in our weekly reading and in our private lives. The continued survival of “The Ethicist” is a symptom of “moral sentimentalism” — an excessive, even obsessional tendency to view the world through the narrow lens of the moral. On the one hand, as “The Ethicist” shows us, this tendency inflates banal social niceties into matters of utmost ethical concern. On the other hand, it simplifies complex political and social problems into moral categories such as virtues and vices, individual choice, and personal responsibility. Calling for everyone to be more ethical becomes a serious political platform, even a policy recommendation. It is easy for some on the Left to dismiss moral claims as nothing more than reflections of class ideology. As someone who has taught ethics professionally, I actually do take moral claims seriously and believe they have their place. But even moralizing liberals should be on guard against moral sentimentalism, because it ultimately serves immoral ends — it props up class stratification and impedes the realization of social justice. For ordinary folk, who have little control over public affairs, it offers the fantasy of feeling empowered, of taking pride in their own individual conduct as all that really matters. It is a new opiate for the masses in our post-religious age. For elites, it is a way of steering the public away from taking political action to reform their affairs. Moral sentimentalism is one of the principal ways in which our bourgeois society checks impulses towards radical change. There is a tension at the core of bourgeois morality. On the one hand, its claims are supposed to be universal. Since its claims presume to govern everyone, the institution requires, both practically and as a matter of ethics, that everyone behave morally. It could scarcely survive without widespread compliance. On the other hand, bourgeois morality is a matter of the heart. It governs the individual and his intentions. Although it makes universal demands, its demands are not political. Bourgeois morality restricts itself to individual persuasion, proselytizing, praise and condemnation. Whether one behaves morally is ultimately left to individual conscience. This is a useful stance for a market-driven society. A sound economy requires trust, which demands that market players follow a shared set of rules. But great success in business can often depend on the entrepreneur’s willingness to take risks and bend rules. However, too much immoral conduct in the system becomes problematic, not only because it can have bad social consequences but also because it undermines the pretense that everyone is subject to its dictates. Such a state of affairs is also demoralizing. It makes the moral life — which is supposed to be its own reward — seem futile. The tension becomes especially clear when bourgeois morality is faced with widespread, stark, and damaging immoral conduct like the sort we saw in the lead up to the financial crisis. It demands reform and yet since ethics is a matter of the heart, it restricts itself to individual conscience, persuasion, and proselytizing, which inevitably prove impotent. “The Ethicist” captures this very tension: it rightly acknowledges that we’re living in a morally anxious time, but at the same time it quarantines that anxiety to light, front-of-the-book material. It channels such reflection inward, towards the personal and the banal. And even on the rare occasions when larger social issues are addressed, it becomes a matter of how we feel and what we believe about such issues (“at least I know this is wrong!”) rather than a matter of what collectively is to be done. “The Ethicist” is also instructive — not in the way it purports to be, but because it assumes a posture similar to that taken by our elites. When they identify political and social problems as moral, they interpret that to suggest that reform will come from each individual looking into his own heart. From a political standpoint, this should be unsurprising. Since elites are, by definition, those who are rewarded under the status quo, they are the ones who tend to be most eager to persuade the public that widespread evil and bad conduct are moral issues rather than political ones. It’s never about failing institutions, political economies, or social conditions. No, it’s about individuals making bad choices and about the public tolerating (read: tacitly consenting) such behavior. The prescription is not political change — we of course have the best system possible — but calls for everyone to look within. Consider our leaders’ stunningly lame responses to the massive fraud at the heart of the financial crisis. First there was President Obama, Attorney General Eric Holder, and Treasury Secretary Timothy Geithner insisting (absurdly) that though there was plenty of greed, stupidity and immoral conduct behind the meltdown, no one broke any laws. Not only is this claim false, but it also condemns their subsequent political proposals. Just a decade prior, after Enron, when it became clear that some conduct by company executives may have been deeply immoral but not criminal, Congress passed Sarbanes-Oxley, which, among other things, required CEOs to certify to the accuracy of their companies’ financial statements. By contrast, despite grossly immoral conduct prior to the 2008 crash, Dodd-Frank focused on making the banks and the economic system more stable and less susceptible to meltdowns and bypassed criminalizing such conduct. Surely Sarbanes-Oxley criminalized the recent conduct of many executives, from Lehman Brothers CEO Richard Fuld on down, but the Obama administration hasn’t pursued them. It seems Congress and the White House believed that vague condemnation and financial settlements (without admission of wrongdoing) sufficed. Most of what happened over the past decade across the world was legal. Bankers did what they were allowed to do under the law. Politicians did what they thought the system asked of them. Bureaucrats were not exchanging cash for favors. But very few people acted responsibly, honorably or nobly (the very word sounds odd today). This might sound like a small point, but it is not. No system — capitalism, socialism, whatever — can work without a sense of ethics and values at its core. No matter what reforms we put in place, without common sense, judgment and an ethical standard, they will prove inadequate. We will never know where the next bubble will form, what the next innovations will look like and where excesses will build up. But we can ask that people steer themselves and their institutions with a greater reliance on a moral compass. What is particularly noteworthy about Zakaria’s thoughts here is that they seem blind to the possibility that institutions steer people as much as people steer institutions. American capitalism, as William K. Black points out, is suffering from a Gresham’s dynamic, in which the profitability of immoral behavior is driving out moral behavior in the competitive market, thanks to lack of regulatory oversight and the inordinate influence of money. We suffer from an illusion that those in the business world will stand to benefit from business conquest, from aggressive and inhuman business tactics. Thus people think that the wealthy in our society — among them the financiers — have a real and genuine incentive to use devious means to attack and subjugate, economically, the majority of the population. Surely rational self-interest — the bedrock of economics — tells us that if we can prove the means and the benefit of subjugating the majority of the population, the incentive becomes not only real but also genuine. We can also see moral sentimentalism corrupting the debate on austerity. Michael Kinsley has served the public splendidly in his crusade against Paul Krugman on stimulus spending, precisely by showing how much the austerity argument rests on moral prejudice. In a 2010 story for the Atlantic , Kinsley intoned that our runaway spending could unleash hyperinflation. On what basis? I can’t help feeling that the gold bugs are right. . . . My fear is not the result of economic analysis. It’s more from the realm of psychology. I mean mine. The last time I wrote about this subject, the Atlantic ’s own Clive Crook called me a “fiscal sado-conservative.” I would put it differently (you won’t be surprised to hear). Maybe, at least on economic matters, I’m a puritan. . . . Obama has done the right things, mostly, pushing through a huge stimulus package and bailing out a few big corporations and banks. Krugman says we need yet another dose of stimulus, and maybe he’s right. But this cure has been one ice-cream sundae after another. It can’t be that easy, can it? The puritan in me says that there has to be some pain. Krugman also is on to something when he talks about paying a price for past sins. I don’t think suffering is good, but I do believe that we have to pay a price for past sins, and the longer we put it off, the higher the price will be. . . . Austerians don’t get off on other people’s suffering. . . . But the austerians deserve credit: They at least are talking about the spinach, while the Krugmanites are only talking about dessert. Three years later, Kinsley is still happy to rest his argument on the intuition that the ‘Krugmanites’ are really just promising Fudgsicles for the kiddies. 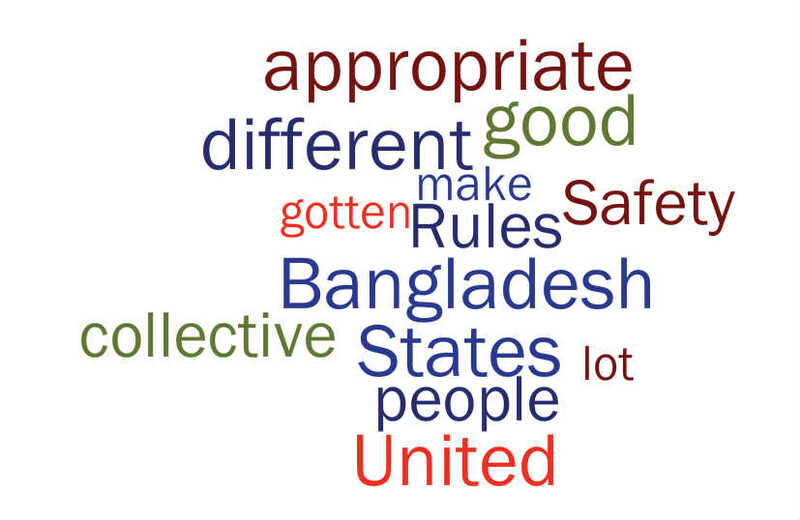 It’s entirely appropriate for Bangladesh to have different — and, indeed, lower — workplace safety standards than the United States. The reason is that while having a safe job is good, money is also good. . . . And in a free society it’s good that different people are able to make different choices on the risk — reward spectrum. There are also some good reasons to want to avoid a world of unlimited choice and see this as a sphere in which collective action is appropriate but that still leaves us with the question of “which collective” should make the collective choice. Yglesias’ comments were not only insensitive to the massive loss of life but totally irrelevant, since the factory boss had violated Bangladeshi law, disobeyed orders from police not to open, and reportedly forced his apprehensive workers back into the crumbling building with threats and beating sticks. In other words, far from reflecting collective Bangladeshi choices, what occurred was in direct violation of them. Yglesias, to his credit, apologized for his carelessness, but nevertheless insisted that his conclusion was correct. Taking up Yglesias’s conclusion, note its emphasis on moral concepts: what’s good, what’s appropriate, what’s chosen. Even if we generously granted him that Bangladeshis collectively made such a choice, such narrow focus would totally obscure the complexity of the situation: the historical circumstances that have led both to the relative poverty and restricted choices of the Bangladeshis that “choose” to work in such unsafe conditions for abusive factory bosses and to the relative wealth and privileged choices of Americans; the responsibility that American consumers and multinational corporations have in supporting these circumstances; and the dismissal of the myriad possibilities for improving this situation because this is, after all, what the Bangladeshis have “chosen.” In other words, his squinting to see the moral propriety of what occurred leads to moral blindness. If only Snowden had graduated from Sidwell Friends School and Yale, then everyone could be certain about the nobility and propriety of his cause. Aides say Mr. Obama has several reasons for becoming so immersed in lethal counterterrorism operations. A student of writings on war by Augustine and Thomas Aquinas, he believes that he should take moral responsibility for such actions. Yes, we don’t need to worry about the incineration of American citizen Anwar Al-Alawki being “a no-brainer,” because the President thought about it in the light of a hackneyed ethics syllabus. Our efforts must be measured against the history of putting American troops in distant lands among hostile populations. In Vietnam, hundreds of thousands of civilians died in a war where the boundaries of battle were blurred. In Iraq and Afghanistan, despite the extraordinary courage and discipline of our troops, thousands of civilians have been killed. So neither conventional military action nor waiting for attacks to occur offers moral safe harbor, and neither does a sole reliance on law enforcement in territories that have no functioning police or security services — and indeed, have no functioning law. In other words, Obama’s drone policy, far from being immoral, is actually the only moral option available. The key point is to see how the president’s appeal to moral safe harbor actually obscures the morally salient issues. His speech made no mention of “signature strikes” — the CIA’s policy of ordering drone strikes against people whose identities are unknown but who are probably militants, based on a host of situational factors. (The topic was raised by a heckler in the crowd — and the president sidestepped it.) His speech gestured at greater oversight and accountability without offering any details. He said that his administration has briefed the appropriate Congressional committees on all strikes outside of Iraq and Afghanistan, including the one against American citizen Anwar Awlaki, ignoring the obvious objection that executing a citizen might require judicial sanction. In other words, although Obama emphasized “morality” and “values,” there was little in his speech that actually demonstrated serious moral reflection. Like a sleepwalker, we seem unable to wake up to the fact that so many of the catastrophic consequences of carrying on with ‘business-as-usual’ are bearing down on us faster than we think, already dragging many millions more people into poverty and dangerously weakening global food, water and energy security for the future. Such commentary should encourage consideration of truly radical measures such as a rethinking of capitalism, zero-growth economics, and massive government investment in mass transit and renewable energy sources. This, in turn, raises the question why these ideas are impossible to implement — the political and economic forces that control the world and the enormous popular upheaval it would take to supplant them. But Prince Charles recently published a book on what he thinks is responsible. In Harmony: A New Way of Looking at Our World, a work he describes as “a call to revolution,” he claims the problem is simply one of perception: we don’t see ourselves as integrated with nature the way that the ancient Greeks and other cultures have. Ultimately, what this means is that we don’t need political change; we need moral change. If only everyone could read Plato and Aristotle in the original Greek, then we’d surely treat the Earth as proper stewards instead of exploiters. For those on the Left who see morality as mere class ideology, there’s not much more to say beyond revealing moral discourse for the sham that it is. But for those on the Left who, like myself, think moral claims are legitimate, exposing moral sentimentalism can serve a useful purpose. Moral passions, I submit, are the most potent lever available for moving the body politic, especially in the context of America’s religious and moralized politics. If there’s an example in US history of a mass political movement that did not depend on moral outrage at perceived injustice or wrongdoing, I’d like to know what it is. Those on the Left who dismiss morality as ideology should consider what they’re losing by abandoning this tool for radical change. For those of us who are sympathetic to serious moral discourse, it is precisely out of moral passion that we should condemn moral sentimentalism. In times like these, “The Ethicist” is unethical. It does for morality what wonk blogging does for politics: it fetishizes minutiae while blinding people to the awful problems we currently face. We are living in a depraved age, while “The Ethicist” frets about swiping umbrellas from restaurant bins. As for elites who address our biggest problems with moral sentimentalism, the point is that if we take their moral claims seriously, then they demand serious political solutions — which is precisely what they try to obscure by speaking in moral terms. If greed caused the financial crisis, then we need to figure out how to reconfigure our financial institutions to neutralize it. If Bangladeshis really chose to have unsafe factories, then we need to figure out how to eliminate the conditions that force such a choice. If the right criterion for deciding economic policy is human welfare, then we need to discuss stimulus and austerity policies in terms of welfare, and not in terms of guilt or sin. Ultimately those who act from genuine moral concern don’t talk much in moral terms, because morality is seen as a shared framework, shaping their behavior and that of others. You will know moral sentimentalists, by contrast, by their excessive moral talk — and their inaction. David V. Johnson is opinion editor at Al Jazeera America .